Dissolve 80 kg crude sugar in 100 litres of water (on about 90°C), and clarify it with 5 kg of activated carbon. Then filter off the hot mixture. Cool down the filtrate (crystallization begins) and add 50 litres of ethanol to it (more sugar precipitates because of the weaker solubility in alcohol). Then filter the sugar crystals, and wash the filter cake with 10 litres ethanol. Tip: try to follow this tutorial with the flowchart editor using example project: Sugar crystallization! Since the program handles the actual content of a vessel as a homogenous mixture (in other words: the program does not distinguish solid and liquid components), "clarification" means "load clarifying material and then filter it off". Use %C unit as often as possible. This makes your project more robust to changes. Do not forget that the filter cake remains wet after filtration. This means: every components of the liquid will be remain on the filter cake, up to certain extent. This extent must be determined by some experimental work. 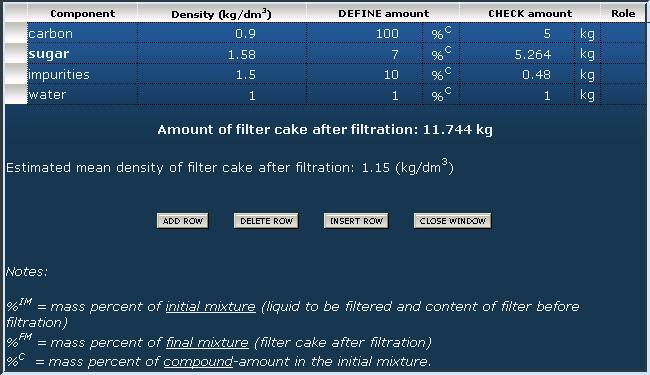 For compounds which are adsorbed on the clarifying material should be set at a higher amount on the filter cake than compounds that are not adsorbed. 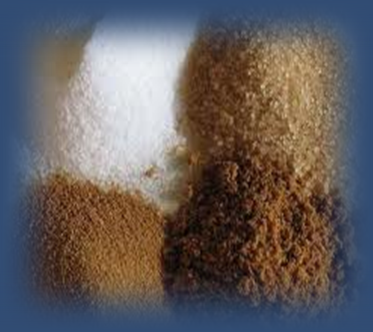 sugar 7 %C : amount of sugar adsorbed by the activated carbon AND contained by the liquid wetting the filter cake. Must be determined by experiments. impurities 10 %C : amount of impurities adsorbed by the activated carbon AND contained by the liquid wetting the filter cake. Must be determined by experiments, too. water 1 %C : amount of solvent wetting the filter cake. What about washing of the filter cake, i.e. remove some components from the filtered material? Use the same principles. Nothing else. Since the program handles the actual content of a vessel as a homogenous mixture (in other words: the program does not distinguish solid and liquid components), "crystallization" does not have it's own "operation code". The user should keep in mind which components are solid and which are liquid or dissolved, and use this information when these solids are filtered. Use less than 100 %C for soluble components. Look for solubility data.